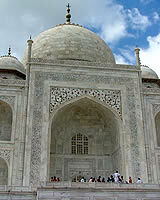 The Taj Mahal is the magnificent white marble tomb of Mughal empress Mumtaz Mahal. 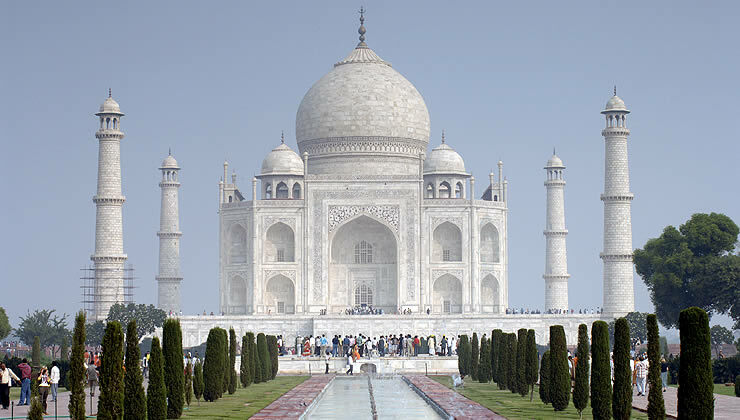 One of the most famous buildings in the world, the Taj Mahal is the mausoleum of Mumtaz Mahal, the Mughal emperor Shah Jahan's favorite wife who died unexpectedly during childbirth in 1631. Begun soon after her death, the tomb complex took more than 15 years to complete and is believed to have employed 20,000 laborers. The tomb, located in a walled garden with a central reflecting pool, is found on the north side of the huge complex, overlooking the Yamuna River. With the open sky as its backdrop, it rises up on a marble platform that is placed within a red sandstone terrace, which contains two additional structures—a mosque to the tomb's west and an assembly hall to its east. The giant dome rises on top of the tomb, which is surrounded by four minarets, and on each facade is a grand arch, known as a pishtaq. Although the Taj Mahal appears completely white from a distance, it is profusely decorated with colorful floral motifs and black marble calligraphy of inscriptions from the Koran. The monument was designed as an earthly representation of the Islamic garden of paradise and its symmetry and precise proportions mark the highpoint of Mughal architecture. 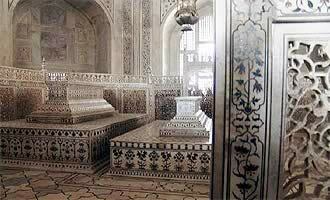 The tomb of Mumtaz Mahal is situated on the north end of the funerary complex on a square marble plinth, which is 328 feet on each side and 19 feet high, centered on a sandstone terrace. 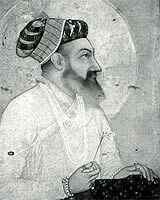 Set in an enclosed garden that is divided into four quadrants (char-bagh), the tomb is approached from a monumental gateway on the south and overlooks the Yamuna River on the north. It is made of fine white marble quarried at Makrana in Rajasthan and embellished with carved floral reliefs and intricate inlay work using gemstones, such as lapis lazuli, jasper, turquoise, carnelian, jade, and amethyst. Although square in plan, 187 feet on each side, the tomb's corners are cut away or chamfered, so it appears slightly octagonal. A tall, recessed portal (pishtaq) is found at the center of each of the tomb's four identical sides and is flanked by a two-story alcove, which is also repeated at its corners. Slender pilasters inlaid with a chevron pattern of black and white marble, topped by lotus bud pinnacles, border each section of the facade. The tomb is crowned by a giant onion-shaped double dome, decorated with inverted lotus petals, and culminating in a 30 foot metal finial. The dome sits on a high drum and its total height, from the drum’s base to the top of the finial, measures nearly 146 feet. 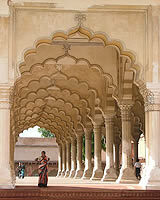 Four octagonal chattris (domed kiosk) frame the central dome on all four angles. 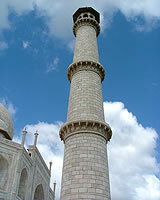 A minaret is found at each corner of the square, raised marble platform on which the main tomb sits. Each of the slender towers is round, with a base circumference of 64 feet, and tapers as it rises to a height of 131 feet. Made of white marble, outlined in inlaid black stone, the minaret has three stories each of with a projecting balcony and topped by an octagonal chattri (domed kiosk) with multi-cusped arches. Although no longer used to call the faithful to prayer, each minaret does include a winding, internal staircase that leads up to its gallery. On each of the four identical facades of the tomb is a grand central portal, known as a pishtaq or iwan. Its recessed arch, which provides a sense of depth, is bordered by a rectangular frame that is inlaid in black marble with inscriptions of Koranic verse. The spandrels of the pishtaq (the triangular spaces on either side of the point of the arch) are decorated with carved arabesque and floral motifs inlaid with precious stones. On each side of the pishtaq is a two-story alcove, which is replicated at the tomb's corners, and the spandrels of its arches feature delicately inlaid flowers. These decorative patterns, found throughout the tomb, were created by adapting the western pietra dura technique, believed to have been imported to the court during the reign of the emperor Jahangir. Small shards of precious and semi-precious stones are arranged to make a complex floral pattern and inlaid into a marble base. 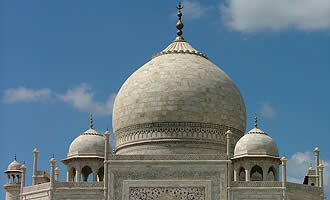 What was the Taj Mahal built to represent? Which architectural aspect do you find most impressive?